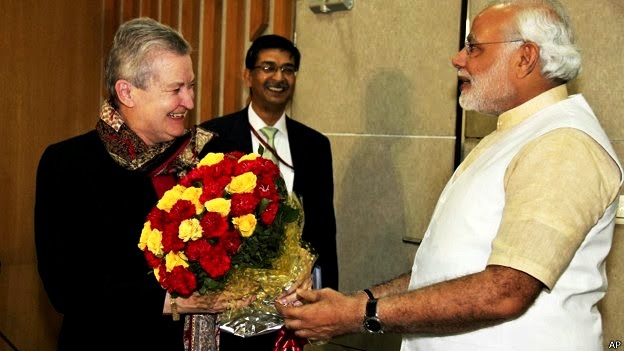 The Valentine’s week meeting between US Ambassador to India, Nancy Powell and BJP’s Prime Ministerial candidate Narendra Modi does not at all mean that the USA has developed new love for Modi. What it means however is this: Americanism and Opportunism are bywords. And BJP propaganda model of election campaigning has gained some foreign currency. Americanism is guided by nothing but USA’s business interest. The Americanism I am talking about does not mind standing with Syrian rebels who draw support from Iran and Al-Qaeda faction, USA’s official enemy. Americanism does not hesitate in tapping phone calls of their “friend country’s” chancellor. The Americanism I am referring to does not mind strip-searching Indian female diplomate, legal and Conventional standings of which are questionable. It’s strange that America finds it important and apt to discuss Human Rights with a politician who they have boycotted for last nine years because of his alleged role in 2002 pogrom in Gujarat. They have revoked Modi’s visas to the USA, both the tourist and diplomatic in 2005. The BJP and Modi lobbyist at several occasions since the boycott and visa ban have raised the issue with the USA but they remained unmoved. They have chosen to talk to Modi at a time that they perceive is the best suited to America’s business. But isn’t hypocrisy what Americanism is all about? In run up to this meeting and after it there have been suggestions that USA might lift visa ban. What has suddenly prompted this sudden change in the USA’s stance, if not the business considerations? Trade and business have been the phrases guiding USA’s any move. Thanks to the highly efficient propaganda model of election campaigning of Modi, Westerns leaders and journalist alike have started believing he is going to be the next Prime Minister of India. But going by the real-politic in India chances of Modi becoming Prime Minister is minimal if not bleak altogether. Under Modi’s command is arguably the world’s best team of image builders and propagandist. And this has hugely influenced how the world perceives Modi. At least in two recent BBC programmes, I have watched the British journalist presenting his arguments on the conviction of Modi being the next Prime Minister. It is this belief of western countries that have prompted their leaders to meet and talk to NaMo. There are convinced if they have to do business in and with India they need to develop rapport with him. Great Britain and European Union have already shunned their policy of untouchability towards Modi. In October 2012, Britain’s envoy met Modi. The European Union made a policy shift in engaging with Modi in the immediate aftermath of his third consecutive victory in Gujarat January last year. BJP’s teams of propagandists have portrayed entire India as riding the so-called Modi wave. They must be congratulated for what they have achieved – made Modi Prime Minister of country months before elections. BJP President Rajnath Singh claimed at BJP’s rally at Bhubaneswar on 11 February that the American Congress praised Modi sometimes back. But the fact of the matter is: America, Great Britain and the EU may meet Modi, “praise” him, give him visas but cannot not give him vote. And in India you don’t become Prime Minister because you have an American visa or because you portray that the country is riding on the “wave” you have manufactured.